Billiard Room: 81 Klipschorns on the front long wall and 76/77 LaScalas filling in the back , and Yamaha RX V863, Sony 400 Disc CD Carousel, Dual Turntable. Pool table in the middle. 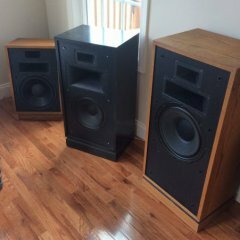 White KG 2.2 from the Judy Klipsch Stash won at the 2016 Pilgramage. Beautiful job Jerry! What a transformation. Makes me want to start sanding on that birch raw split that somebody covered up with stain. The Cornwalls might help the bass that LaScalas lack, you just have to tame the midrange from your LS somehow. You’ll get there. That is correct Russ, but on a Cornwall budget. Yes, but you may save congratulations for later this week when they are delivered by Pony Express. (Big Thank You in advance to Jerry) and of course Mr Klipschorn in Cincinnati. Thanks Jim, Couldn’t go wrong buying from Budman. He knows about Klipschorns and all things Heritage. LaScalas need space. Base needs room to develop and mid range needs room to mellow. Ideally 16 feet minimum in my opinion but you gotta work with whatever you have. I know others may not share my opinion but that’s just been my experience since 1977. However nobody can argue the fact that they were originally created as an outdoor public address system.